Nature’s palette has long been a guide to beautiful, inviting and natural interiors. 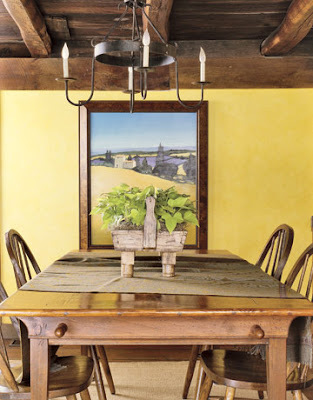 No exceptions in this Connecticut home which has taken cues from the warmth of a yellow sun , energy from a turning leaf, and the strength of hard woods. A dining room kissed with golden hues, and chestnut flooring and ceiling beams, are some of the incredible features of this home. Thanks to Heather over at Gathering Spriggs for inviting me to be a guest on her beautiful Blog about all things stylish. 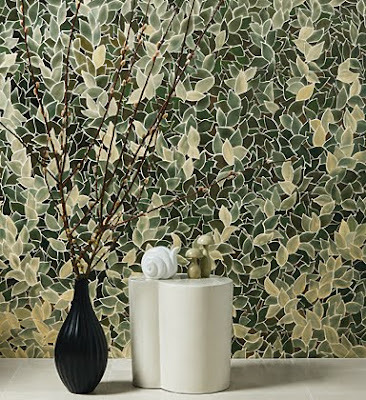 Nothing makes quite the impression like a bathroom wall, tiled artistically from floor to ceiling with gorgeous colour and pattern. Not only is it beautiful, but incredibly durable as well, making it perfect for high traffic areas as where water can do damage. 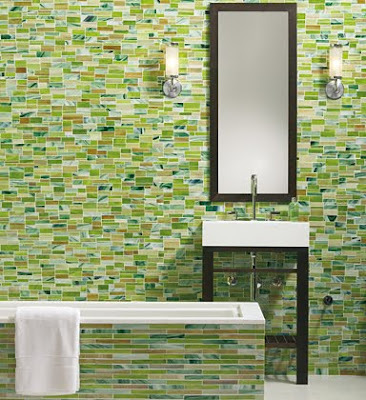 The selection of tiles you can find from Ann Sacks is impressive and moving. Botanical, geometric, picturesque, vibrant are just a few of the themes you can find. Of course, cost is always a concern. 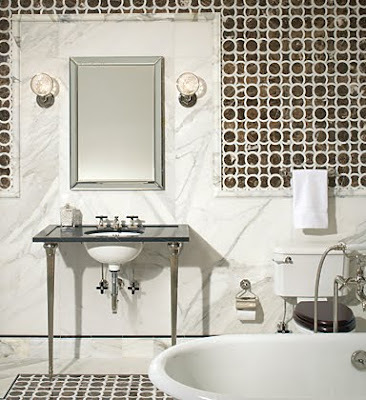 But in areas like a bathroom where the surface area is much smaller, it can be quite affordable. 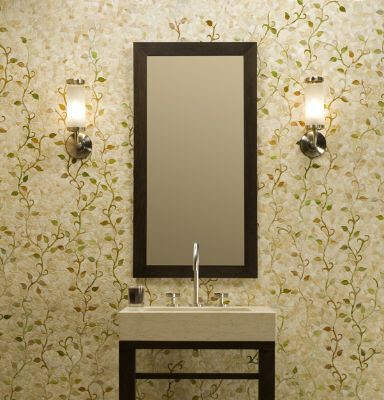 A vanity room, is a wonderful place to create design impact. The collection of Ann Sack's tiles shown in this gallery are inspiring for the unique shapes and designs, as well as their craftsmanship. In the very first image above, mosaic tiles are cut and painted by hand. Below Glass, gorgeous circular tils in various sizes. 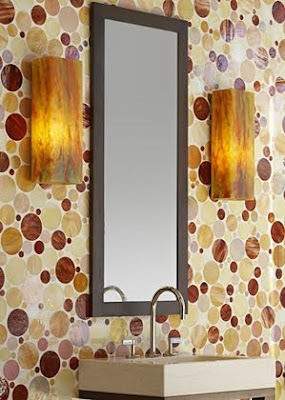 Go ahead and make a splash - literally and figuratively, these tiles can handle it! 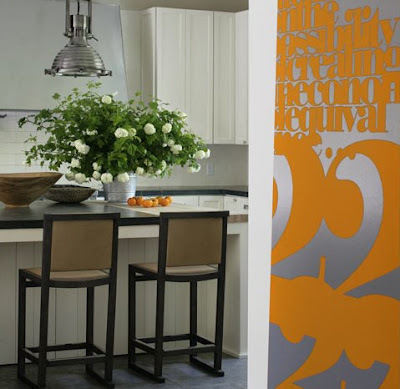 While Browsing Meade Design Group Blog, which I do often, I decided to explore the work of this exceptionally talented designer, Brad Ford. There were a number of wonderful properties to explore in his portfolio, but this one really resonated with me. 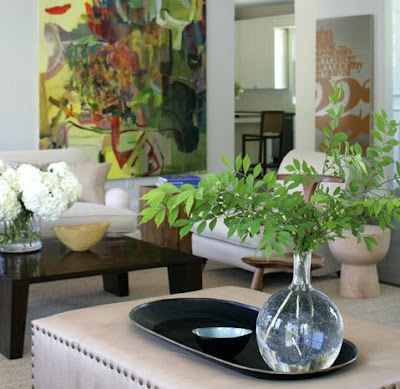 The artwork and interior compliment each other in a very easy and relaxed environment. 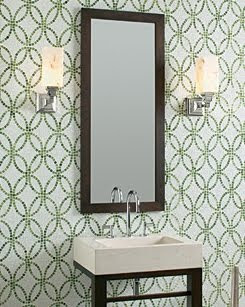 A beautiful Scandinavian influence, that is modern and sophisticated, and completely functional. 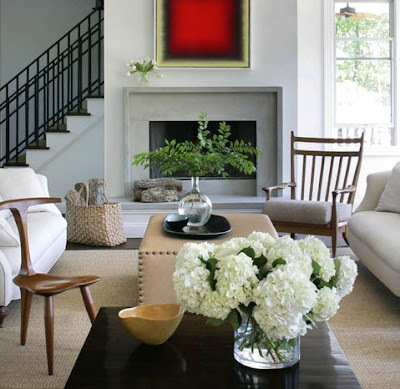 How beautifully this red artwork and bowl compliment each other, it's as if they are part of the same body of art. The sofa above, appears to have begun as a bitter dispute between husband and wife. "White Slipcovers!!" "Smoking chair Leather!!". If only all disputes could be resolved with such harmony. I wish I had more information about the artwork to share with you- what a magnificent green textured piece hanging behind sofa. Industrial kitchens make me feel like a chef. 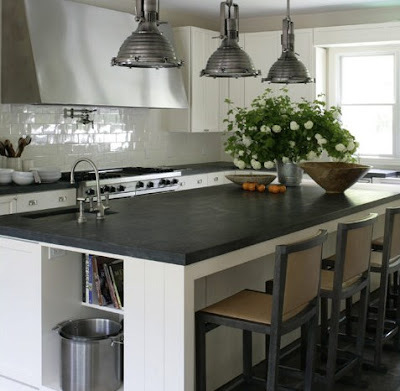 Great pendant lighting, large work surface (not sure if that is slate or concrete) professional oven, and white subway tile make an inviting space for family and guests to gather. Inspirational Mirrored message board in the office. When you get tired of sitting at a desk and staring at your monitor, a fabulous lounge invites you to sit back and read notes, magazines and books. Brad Ford also writes a blog called Design Therapy. One of the highlights of my day is tweeting with Amy of ABCDDesign, and reading some of the wonderful posts on her incredibly inspirational Blog. From Interiors, weddings, food, paper - everyday offers a burst of creativity. Amy is an artist, designer, stylist, a fabulous cook (I have tested her recipes & they are fantastic) a New Yorker, and a really natural and genuine spirit, that I have the pleasure of befriending through the world of blogging and twitter. When Amy announced she was celebrating her 2 year Blog-iversary, I was thrilled! Especially when I read the words Give-Away.. and The Hip Hostess! 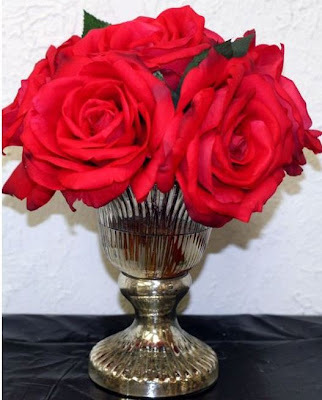 The Hip Hostess is a really cool online shop for the woman who likes to entertain with a little sophistication. They have the most stylish line of aprons and tea towels, you'll look like the Queen of Couture while serving up them Hors D’Oeuvres. You must check out their online Boutique. Through a series of events, you'll have to read about here. I am the proud owner of the wonderful matching set below. I wanted to express a special Thank You to Amy at ABCD Design, and to Debbie and Andrea at The Hip Hostess, for this beautiful, thoughtful and much needed gift. And it couldn't come at a better time either. Some of you know I write another blog, called Casarecce. It's about my love of all things made by hand. Cooking, baking, knitting, and crafts, it's a place for me to display some of my work as well as the work of others who are doing it right. I am so excited to announce that my cousin Anna decided to join me at Casarecce. She is a true artist. Everything she touches turns beautiful, and I am very lucky to have someone to share my passions with. This December, we are hosting our 2nd (almost annual) "Bring Your Own Apron" Party. It's where the woman of our family, gather to exchange the recipes that have been in our family for years. It's also where Anna and I will no doubt, burn our fingers on the Pizzele Iron. But I will at the very least, look fabulous, in my new apron! This is perhaps, one of the most inviting living rooms I have ever come across. Beautiful stone fireplace, flanked by gorgeous window benches, plenty of bright light, french doors leading to the garden, and a distressed book table with a vase of tuips sitting atop. Brilliant. Yup! This is the country you are looking at! Weekend home of Kate White, Editor in Chief at Cosmopolitan. After the hectic hustle of a New York week, this is the vibrant place the entire family escapes to in Pennsylvania. 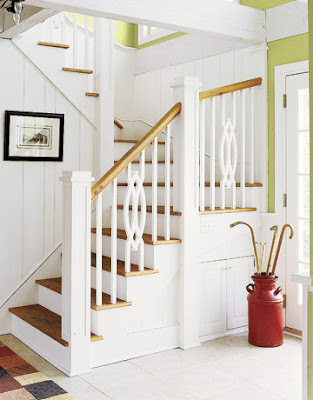 This apple green entrance is the first sign of peace, and it carries through to the main living room, and the front stairway. This colour? Mango. 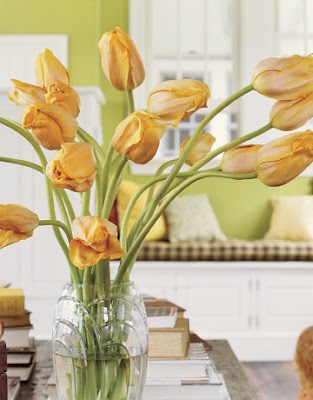 It's a beautiful compliment to the green in the hallway. The interior was designed by Denny Daikeler, decorator and author. The colours are incredibly intense and evoke sheer happiness. 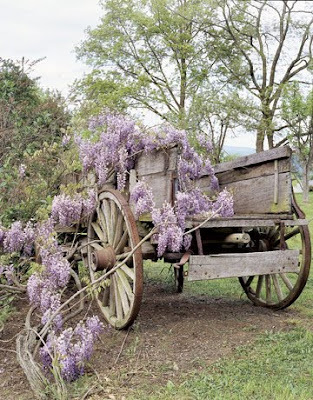 The porch surrounded by acres of nature, is a pleasure to the sight and senses. The sounds of nature, beautiful breezes and energizing colours during any season. This home is completely unassuming. 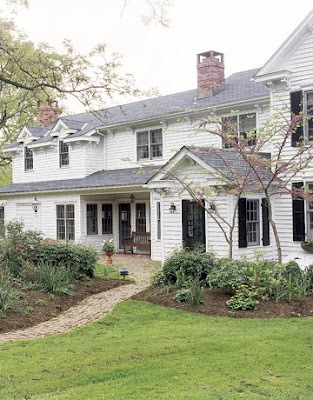 It's an 1860's renovated farmhouse, which includes a seamless expansion, and addition of more windows and french doors. 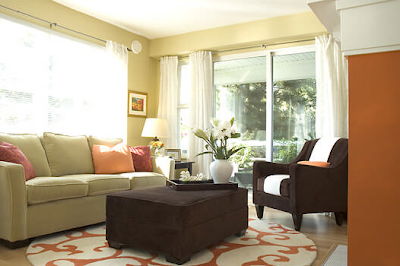 It is simplistic and natural, and serves up comfort and style for a busy family. The full story is featured here at Country Living. 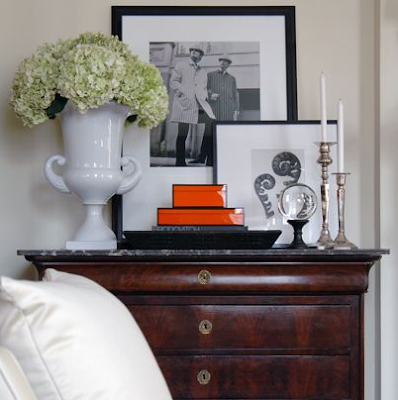 This 4000 sq foot residence in Mississippi is home to interior designer Nancy Price. She collaborated with her husband, a builder, to design this magnificent retreat. It is filled with warm sandy tones, and then dollops of beautiful blues. 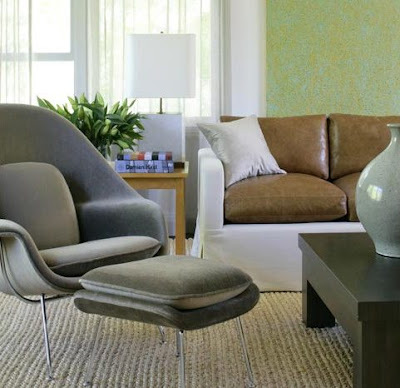 In her interview with House Beautiful, she responded wonderfully to a questions about whether or not she was a modernist or traditionalist. "At heart, I'm a modernist. I begin with modern bones. But my love of collecting won't let me live that way, because I still love antiquity — a beautiful reliquary, an old master painting, or a great old gilt piece. So my design is a study in contrasts". This is truly evident in the composition of her home. It may be filled with antiques and reliquaries, but is is scaled down, and simplistic, giving it a modern edge. 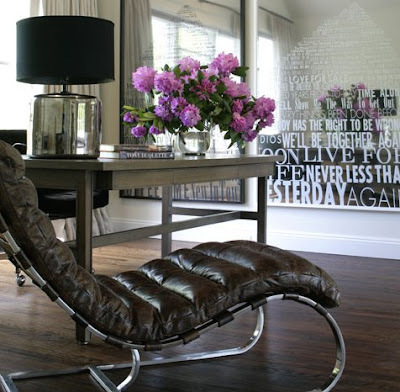 A beautiful contrast to a crisp and clean kitchen, is an old beat up leather smoking chair. 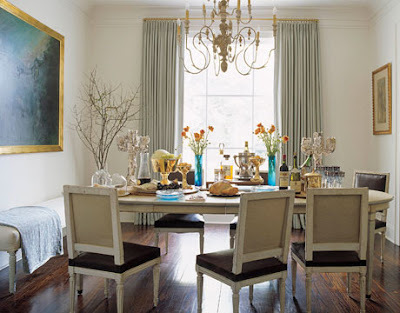 And above, a linen slip covered breakfast bench, mixes formal and casual. 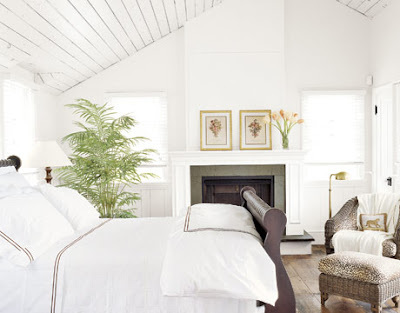 This master bedroom is a romantic escape. 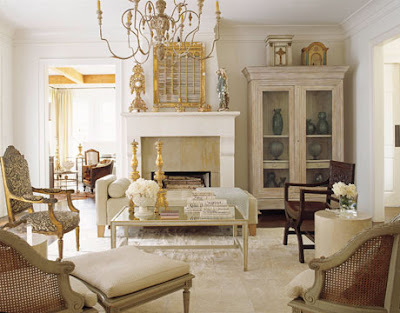 The blue-gray, creams and golds make it luxurious and relaxing. Draperies are taken way up to the ceiling. 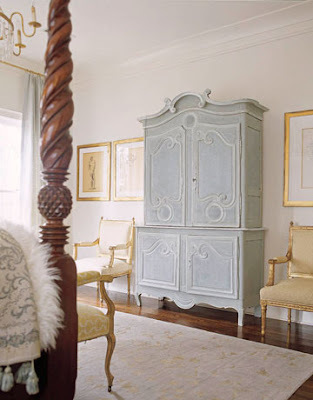 Art and gold finished chairs frame a beautiful blue buffet de corps, which houses a TV. Four poster bed my Mark Hampton. It is a memorable pleasure to step inside the home of a newly built residence owned by a designer and a builder. 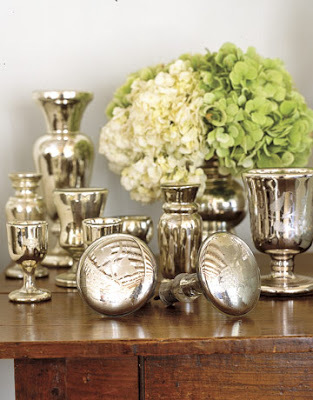 Nancy Price and husband John have created a remarkable collaboration that marries, form, function and design. A few months back, I was looking for some floral inspiration when I stumbled across this beautiful website, Sophie Dahy. I found exactly what I was looking for - only in Silk. 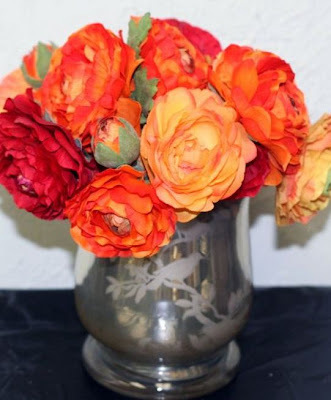 Each bouquet vibrant and set in the loveliest vases and pitchers. The original post is, here. 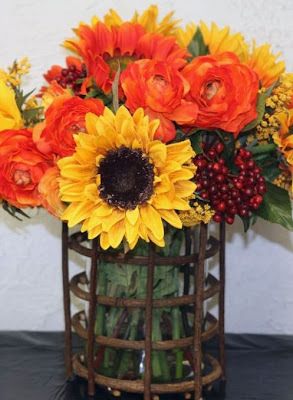 Much to my delight, they recently added some of their latest fall arrangements to their already magnificent collection. Jeanne Hyatt and Linda Raulston, owners of Sophie Dahy, also recently announced a collaboration with Bunny Williams, to fill the Parish Cachepot in her BeeLine Home Collection. These magnolias are truly exquisite, sitting in this hand painted piece. I am so excited to introduce my guest on Behind the Blog today. Reading a post from Colour Me Happy is one of the higlights of my day. 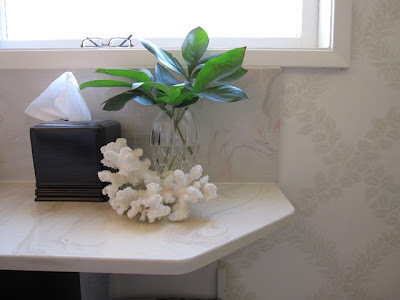 Maria Killam is the author of this beautiful blog that is more than just a design perspective. It is a place where I find inspiration, education, a mentor and a motivator. There is passion behind every stroke of the keyboard, and every post is thoughtfully composed. So without further ado, here is Maria Killam. What lead you to pursue a career in design? After 10 years of decorating for my family and friends I decided it was time to start my own business! Any early experiences in design that stand out? 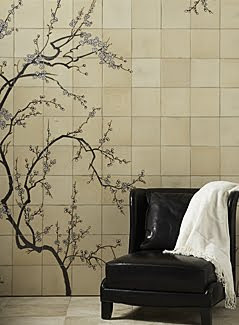 When I was 16 I bought taupe wallpaper with white flowers on it for one wall in my bedroom. I painted the rest of the walls white to match the flower. After it was done I realized I should have painted the background colour (taupe) as it would have flowed a lot better with the rest of the room. It's noticing the details that makes me such a good teacher now (I hope). What excites you most about design today? That people are starting to embrace colour and experiment with it more. Years ago, it was just one accent wall, now it's colour everywhere. I love that! What inspired you to create Colour me Happy? I had been reading blogs for about 6 months when I listed to an on-line talk announcing that 'everyone should have a blog' so suddenly one weekend I started writing. The name came to me immediately, (inspired by Julia Roberts) read it Here; and I barely slept that weekend as I wrote 8 posts! 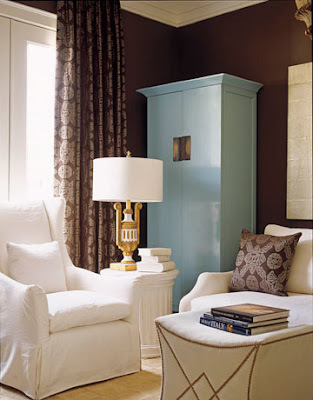 One of them, The Best Trim Colours--NOT Cloud White is still one of my top 5 most read posts. Seriously, can you pick a favorite colour? Because they are like my children so how can you pick one? It's hard but yellow, orange and green are up there as favourites for me! Definitely the morning or when I present my design plans to a client and they get excited about what I've shown them! That gives me a happy buzz that lasts the rest of the day!! Fresh, contemporary, comfortable and colourful! What item in your closet can you not live without? My living room. Just walking into it makes me happy, I have a beautiful view of the mountains, city and the ocean, huge picture windows and a great ottoman to put my feet up! Who are your style/design icons? Eileen Kathryn Boyd, David Jiminez, and Kelly Wearstler. Your 3 most memorable posts of recent & why? 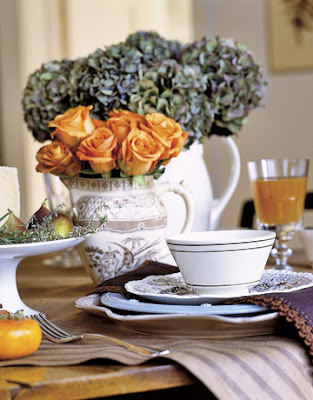 How to create a Tablescape. It took me 7 hours on a Sunday to write, so I was thrilled when it made the Washington Post Blog watch the following week! 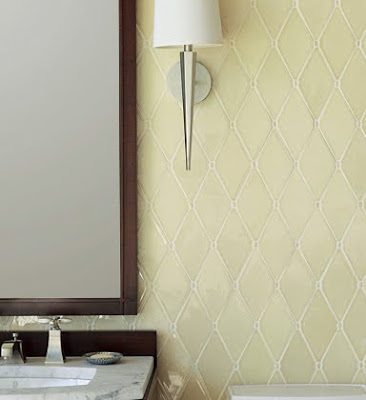 I was also very excited to be in the Post for the 5th time with this post; 4 Things you need to know; Before Shopping for Wallpaper. "Signature Look or your Clients Look; Which one works the best?" This one I was really excited about because I have just distinguished for me what my 'look' is and I was thrilled to share it with my readers! Are there any exciting projects you are working on right now, that you can mention? Yes, I have a few! Stay tuned to my blog and look for my posts about them! Lastly, what brings you true happiness? That every day I get to do what I love is a huge source of happiness for me and of course being with my family and friends!